Drumroll please….the Flavor of the Month for June is…..CHERRY! Derek loves cherries and his birthday is this month, so it seemed fitting! We’re starting this Flavor of the Month off right with Cherry Almond Granola. You may remember that I mentioned back in my Coconut Granola post that I tried this flavor combo. 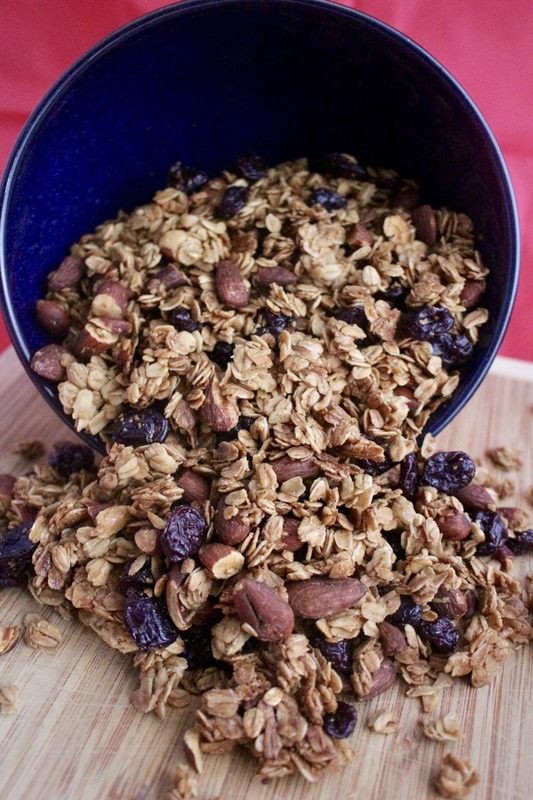 The tart dried cherries are great with the sweet granola and crunchy almonds. 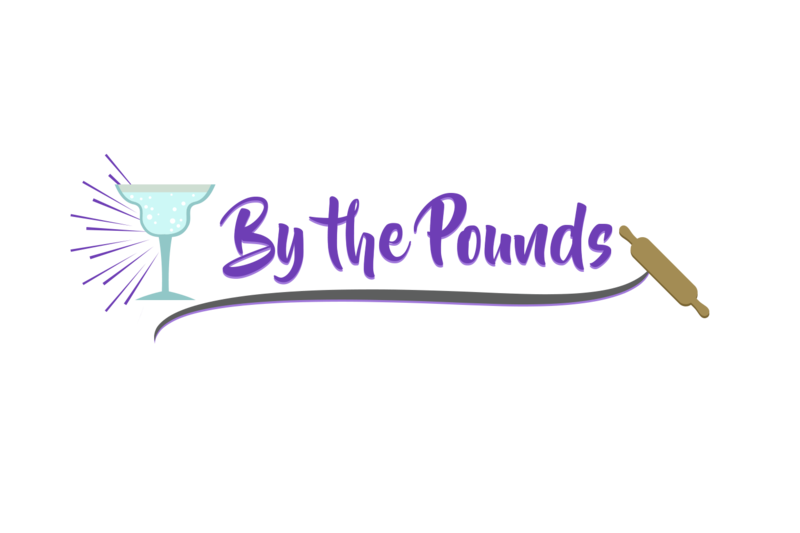 This recipe is similar to the coconut pecan recipe except some of the vanilla extract has been swapped with almond extract to amp up that almond taste. Then of course we’ve swapped coconut and pecans for cherries and almonds (that probably went without saying, but there you go, he he). Start by preheating your oven and covering a large cookie sheet with parchment paper. The parchment paper is dual purpose- it ensures the granola doesn’t stick to the cookie sheet and also acts as a scoop when you lift up the sides. Now whisk together the maple syrup, brown sugar, vanilla and almonds extracts and salt together until smooth. 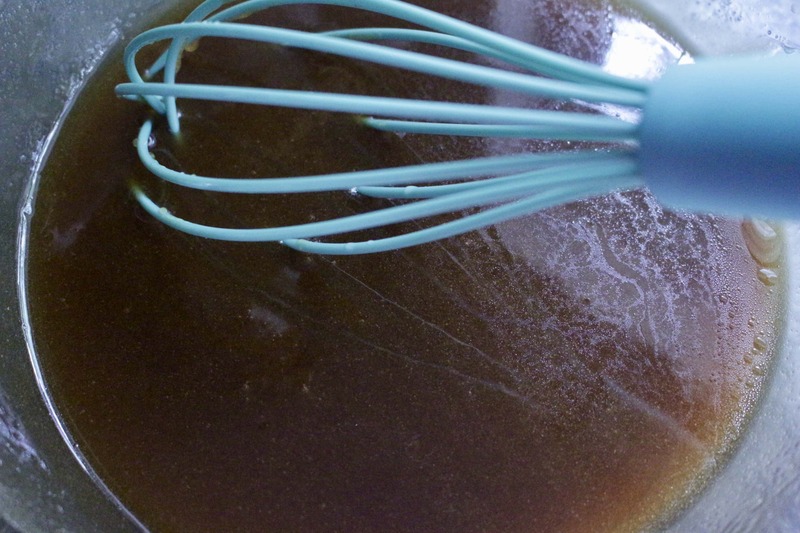 Gradually whisk in the vegetable oil until it is completely combined. 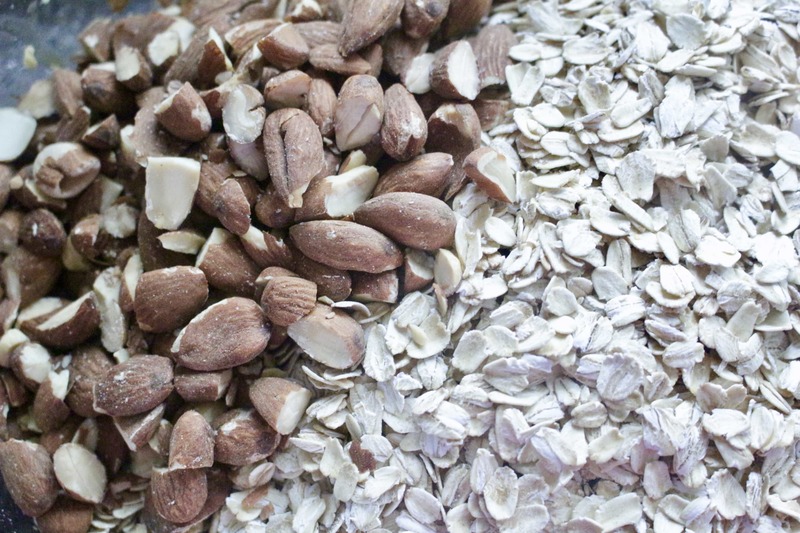 Then you’ll add the oats and almonds and stir until they are coated with the liquid mixture. One note about the oatmeal. I don’t bother with a fancy brand or steel-cut oats. I just use Quaker old-fashioned oats (or the store brand equivalent). Don’t worry, I didn’t forget about the cherries. They will be added after the granola has baked and cooled so they don’t burn in the oven. Spread the coated mixture on the lined cookie sheet. Now using the back of a spatula, the bottom of a measuring cup, or your hands, compress the granola. 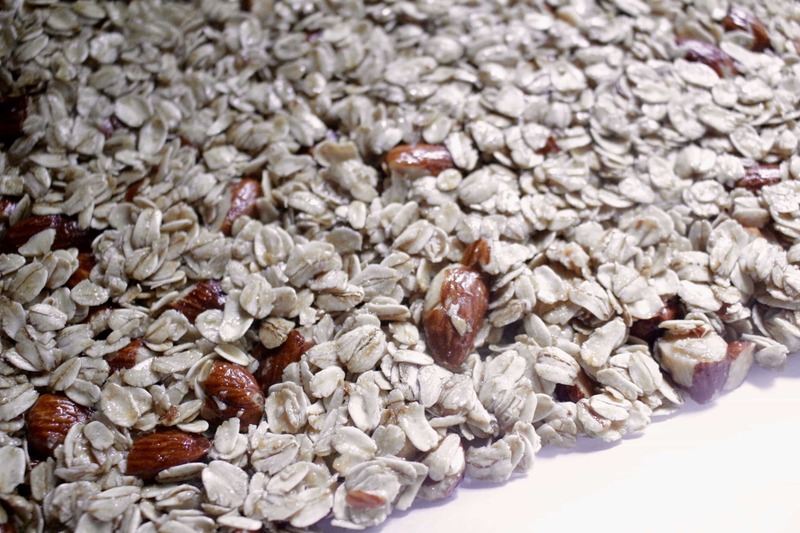 Pressing the granola like this ensures you’ll have nice large chunks in the final result. Bake for a total of 45 minutes, turning about halfway through . The mixture will not seem firm, but it will crunch up once it has cooled for about an hour. 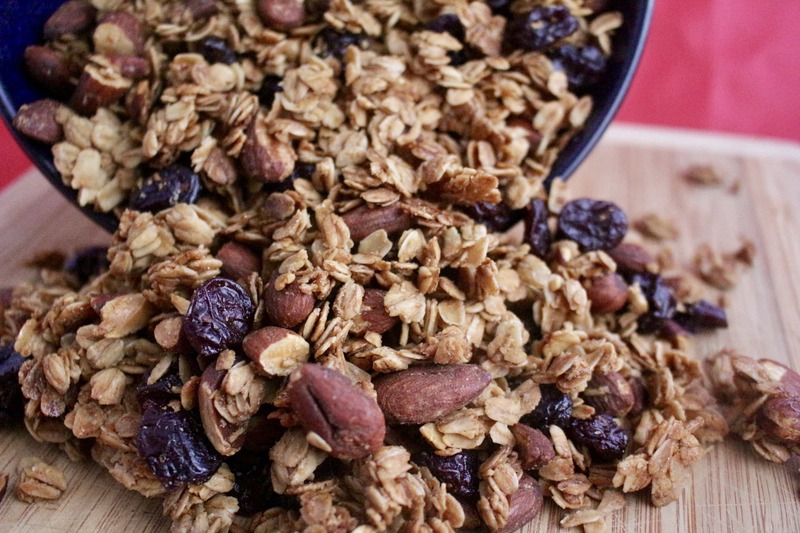 Break the granola into hunks in a bowl and gently stir in the cherries. 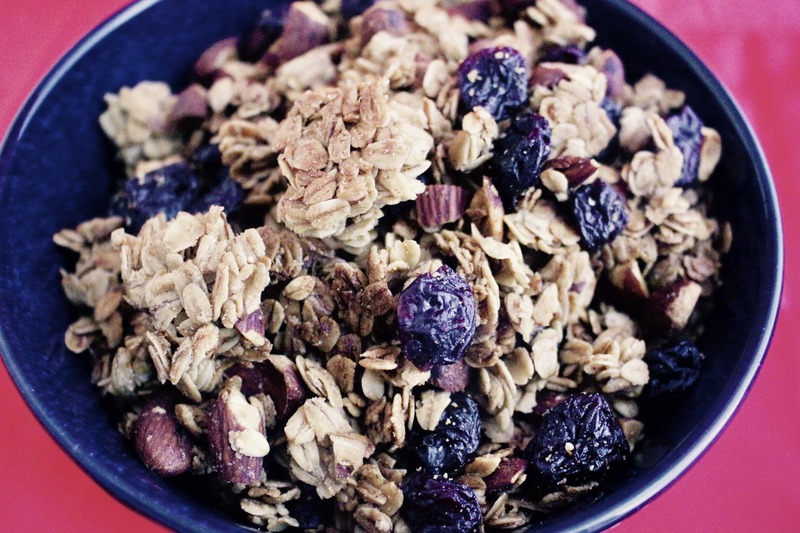 This granola is of course great over yogurt or with milk. I also think big hunks of it would add an interesting element to a cheese tray. Whisk together the first 5 ingredients In a large bowl, until combined. Whisk in the oil slowly until it’s completely mixed in. Add the oats and almonds and stir. Spread the mixture onto the cookie sheet in an even layer. Press down on the granola mixture to compress it. Once out of the oven let cool for about an hour. 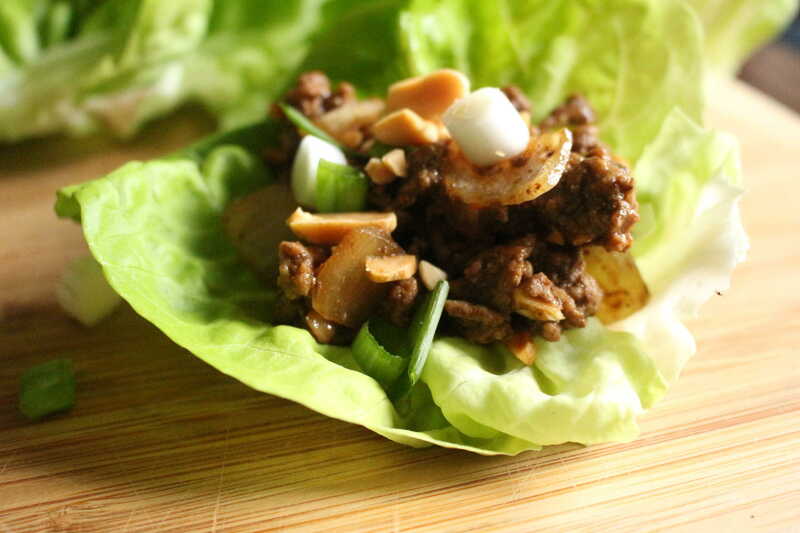 Break it into chunks in a bowl and gently stir in the dried cherries. Stored in an airtight container, it should last for 2 weeks.